Ryan Garner may be barely out of his teen years but already the spiteful punching Southampton starlet has designs on proving himself ‘The Daddy’ of the domestic featherweight division. ‘I know that, outside the ring, I still look a baby-faced kid but I’ve never felt like the ‘boy’ between the ropes,’ states the 5ft 6in angel-faced assassin who steps up to six round level on Saturday’s talent-stacked bill at London’s O2 Arena. ‘Already, I’m as strong as every opponent I’ve fought – I’ve pushed ‘em all back – and I’ll only get stronger. I do a lot of S and C work against my own body weight, loads of stability and core work. 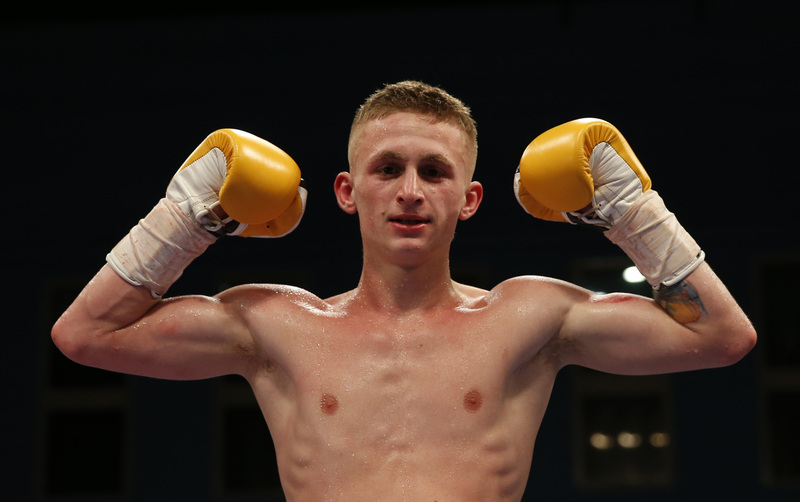 ‘Right now, the British featherweight division is booming and I can’t wait to get involved,’ claims the ex-carpenter’s apprentice who is trained by Wayne Batten on England’s south coast. ‘You’ve got Frampton, Warrington and Selby at world level. Ryan Walsh is a real top quality British champion who can really switch it on, on his best nights. He’s very well drilled, no glaring weaknesses. I think he’ll come through his rematch with Isaac Lowe. I didn’t really rate Isaac when we sparred. ‘Recently, I won a lot of money on Ryan Doyle against Reece Bellotti. While Bellotti has heavy hands, his boxing ability is shocking. ‘But in a couple of years down the line, I’ll be happy to get in with any of them. I just need to get valuable experience at six, eight and ten round level. If I want to be a major champion, I’ll HAVE to fight someone good. Latterly, Saints fan Ryan has accelerated his apprenticeship with extensive spars against white hot Irish double Olympian Michael Conlan. ‘I’ve been having quality spars two or three times a week with Mick at Adam Booth’s gym in London, ahead of his homecoming in Belfast next weekend,’ says Garner who represented England on 19 occasions as an amateur. ‘We really push each other and you’d pay to watch us. He’s 26 and I’m still only 20. Mick’s punch variety is very good and he’s so smart. He forces me to think more. My boxing intelligence has come on hugely. Saturday’s bonanza bill features several of the nation’s most gifted young talents and the scramble for post-fight accolades and column inches is sure to be intense. Garner, who confronts Hungary’s 6-3 Norbert Eszenyi, will need to be at his vicious best if he is to court attention. ‘Fight night is feeding time for ‘The Piranha’!’ he quips. ‘I turned pro for these kind of nights. Hopefully, fans will enjoy my all-action style and my passion. I throw a lot of punches, that’s my main attribute. As opponents fade, I get more into it. ‘It’s a good test. From what I’ve seen on tape, my opponent’s a very game boy, likes to fight back. But that’s how you learn, get rounds. I intend to stop him, but hopefully, it won’t happen too early.